Cooking meals at home instead of going out to eat is a great way to stretch your food budget. I enjoy cooking, but with two young kids at home, it can be difficult to cook a meal without distractions. Sometimes it seems easier to just go out to a restaurant or get take-out! Eating out is convenient, but the costs can add up quickly. It’s also healthier to prepare meals at home because you can control the ingredients. Kids are curious and love to learn new skills, so one day I asked my son to help in the kitchen. He had a great time and felt so proud when the meal was done. Since he was close by and focused on his tasks, preparing the meal was easier for me too– so it was a win-win situation. Involving kids from a young age is a great way for them to not only learn about different foods and cooking skills, but to learn other valuable lessons as well. They learn math while measuring liquid ingredients or counting eggs for a recipe. They can develop physical skills when kneading dough, stirring batter, or peeling carrots. helped measure and pour the ingredients into the bowl, stir the batter, and put the cupcake liners in the pan. 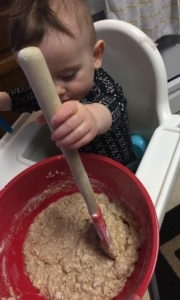 My daughter played with mixing cups and wooden spoons and helped stir the batter. They both tasted the applesauce and chopped apples before adding them to the batter. Older children can be more involved and assist with things like chopping and peeling the apples and reading the recipes. It can get messy at times, but it’s also a lot of fun. This muffin recipe is great for kids because it includes healthy ingredients – oats, applesauce, and apples. Also, there are no added fats, such as oil or butter. Most of the ingredients are pantry staples, making it a budget-friendly recipe. Best of all, both of my children enjoyed muffins, so we’ll be making the recipe again soon! Would you like to find other recipes that your children will enjoy cooking with you at home? This online USDA cookbook, Recipes for Healthy Kids, is a great resource, filled with delicious, kid-friendly recipes.